Beautiful high quality boutique clothing outfit for girls this St. Patrick's Day occasion..
[PLEASE READ] SIZE CHART IS IN THE LAST PHOTO. TRUE TO SIZE. PLEASE CHOOSE THE SIZE YOUR GIRL USUALLY WEARS. DO NOT refer to AMAZON's General Size Chart. Size 2T is for average 2-3 year-old girls. Size 3T is for average 3-4 year-old girls etc... If she is in between SIZES, choose the bigger size. Outfit you receive will have alphabetical size tag that is equivalent to the numeric size you chose. 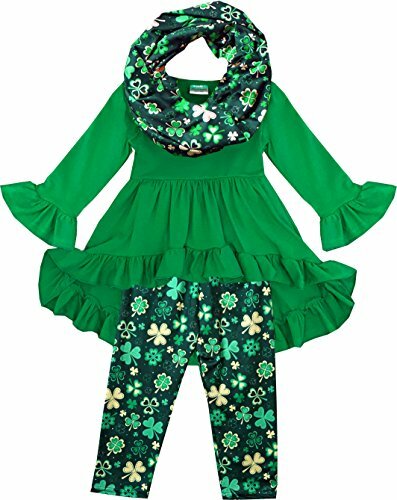 3 piece set include: Green hi-low tunic top, matching leggings and scarf ! Made with soft cotton fabric, super comfy, while still being so stylish!